A few months back my friend Nate and I brewed a batch of dark ale with Munich malt accounting for most of the grain bill. The result of our collaboration was supposed to be a rich roasty porter, but the Briess chocolate malt and roasted barley were so light that the result doesn't have the roasted flavor/aroma we were expecting. The Munich malt provides a great toasty/bready backbone, but the coffee/chocolate character just isn't there. These malts are interesting and could add good dimension to a porter/stout, but you'd have to use a much higher percentage or combine them with darker grains to hit a classic flavor profile. Seeing the DC Brau sticker on my keggerator reminds me to mention how excited I am about the opening of DC's first production brewery in something like 40 years. They are hoping to start brewing in the next few months, canning a Belgian Pale and an IPA and doing some seasonal release bombers. 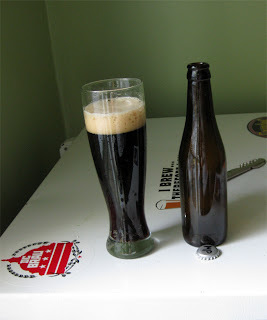 I've known Jeff (the brewer) for a couple years, and gotten the chance to try some of his homebrew (like a wonderfully funky blended Lambic) as well as a test batch of a brown (with plenty of brown malt) he did for the new brewery. Appearance – At first glance it is an opaque dark brown, but held to the light it is a surprisingly clear leathery amber. The tan head pours with decent height, but quickly slips to an 1/8 inch covering that lasts until the glass almost empty. Smell – Light chocolate (sort of like a cheap candy bar) with a hint of spice from the Willamettes. Rich bready tones (fresh crushed grain) and a subtle creaminess come through as well. Taste – Well rounded breadiness with a subtle mocha character in the finish. The roast is not nearly as potent as I was intending with ½ lb chocolate and ½ lb roast barley. It has a nice balance with a kick of bitterness at the front and a moderately sweet finish. The Wyeast 1968 London ESB did it's job, leaving a malt tipped beer despite the 40 IBUs. The character is not unlike an Imperial Mild. Mouthfeel – Beautifully creamy with nicely subdued carbonation. The flaked oats and wheat really helped, I like the fullness from the beta glucans in flaked grains more than from the dextrins in carapils and other crystal malts. Drinkability & Notes – Not a bad beer, but not really what Nate and I were aiming for. The Briess chocolate/roast are good, but didn't have the impact I'd expected. I'm surprised that a half pound of roasted barley didn't make itself known, that seems like a decent amount for five gallons. there is some roasted barley that i really and some that i really don't like. i always forget to write down which im using so when it comes time to taste its always a surprise. for example, right now i have a milk stout that i don't really care for and an american stout that i think is great. pretty sure the one i don't like is munton's but i'm really not sure. For me porters have been a difficult target to hit. My stouts are always tasty, but I can never quite achieve the roastiness that I enjoy so much in well made commercial porters.